Shots ring out in the dark. A body goes down. A melee ensues: Witnesses frantically call 911, cop cars speed down side streets and a gunman runs off. Within minutes, law enforcement launches a small, remotely piloted aircraft. Like a model airplane, or quadrocopter, it hovers and darts, prying into alleys and backyards with night-vision cameras, searching Spokane for a killer. It sounds like science fiction. But it’s actually a plausible future right here in the Inland Northwest. “With fewer and fewer officers in the field, technology is going to be something we’re going to be relying on more and more,” says Spokane County Sheriff Ozzie Knezovich. The Sheriff’s Office is considering using unmanned aerial vehicles (UAVs), also known as drones, once regulators clear them for domestic use, Knezovich says. He touts the benefits of drones for law enforcement: They keep officers out of harm’s way, cost less than helicopters and can help in standoff and search-and-rescue situations. 50,000 - Altitude, in feet, that a Predator Drone can fly. 61 - Number of universities, research labs, government agencies and branches of the military currently authorized to use drones, according to public records. 6.5 - Wingspan, in inches, of a micro-drone known as the Hummingbird. 10 - Number of drones purchased so far by the U.S. Customs and Border Patrol, according to a U.S. Department of Homeland Security report. $18 Million - Cost of a Predator drone, according to a U.S. Department of Homeland Security report. But Knezovich is aware of the perception. As the Federal Aviation Administration begins clearing the way for drones to operate in domestic airspace, communities around the country must figure out how to logistically and legally navigate the technology. Proponents see a future of small, unmanned aircraft that can monitor America’s borders, help make crops more efficient and provide low-cost surveillance for police. But critics worry that drones will bring America ever closer to a “Big Brother” society, with less and less personal privacy. Drones, some say, could even end up deploying weapons like stun guns or tear gas as they soar over (and spy on) activities like political rallies. Futurists, bureaucrats, technophobes and civil rights advocates will have to reconcile their diverging ideas of what it means to have robots plying the skies. Especially since the robots are already here. The weaponized drone first emerged in World War II, when the Germans used a plane-launched, remote-control bomb known as the “Fritz X.” In September 1943, the day after Italy withdrew from the Axis Alliance, German bombers used a Fritz X to sink the Italian battleship Roma before Allied powers could move it to a safe port. But only since the Sept. 11 attacks have drones been used regularly as an attack craft, striking about 115 targets in the first year of America’s war with Afghanistan, according to International Affairs Review, a policy publication of George Washington University. From there, the U.S. deployed drones for surveillance and missile strikes throughout the invasion and occupation of Iraq. Recently, drones have conducted targeted assassinations in countries with which the United States isn’t even officially at war: Somalia, Yemen and Afghanistan’s neighbor, Pakistan. According to data from the New America Foundation, a nonprofit think tank, U.S. drone strikes in Pakistan have killed between 1,800 and 2,900 individuals. According to the estimates, as many as 470 of them weren’t terrorists or combatants. They were civilians. A 2011 drone strike over Yemen killed a U.S. citizen, a radical Muslim cleric named Anwar Al-Awlaki. In planning that action President Barack Obama’s administration had to author a secret memo to justify executing an American without due process, according to New York Times reports. “The government has also resisted growing calls that it provide a detailed public explanation of why officials deemed it lawful to kill an American citizen, setting a precedent that scholars, rights activists and others say has raised concerns about the rule of law and civil liberties,” the Times wrote last October. The growing presence of drones over foreign skies, however, has coincided with a decline in criticism since their introduction as a weapon, according to Joseph Nevins, a Vassar College associate professor of geography who studies border control issues and homeland security. “Many [liberals] raised hell about this in the Bush administration,” Nevins says. “But because one of their own is doing it, it’s OK.
Now, aided by defense manufacturers and lawmakers — there’s even the Unmanned Systems Caucus in Congress — drone technology is coming home. Nevins attended two trade shows — one in Denver in 2010, another in Washington, D.C., last year — that marketed drones for domestic use. Prototypes of the aircraft filled the cavernous convention spaces, along with promotional videos showing fictional scenarios of drones locating enemy combatants to be killed by air strikes. Presenters there didn’t speak of drones’ war role but focused solely on humanitarian potential, according to Nevins. “Here you are in the face of an industry that, among other things, is dedicated to killing,” he says, adding, “It comes across as very sanitized. The FAA, which is in charge of developing regulations for drones, reflects the tension between the military pedigree of drones and their future in civilian life. Currently, the FAA allows drones and model aircraft to fly without a permit beneath 400 feet for hobby purposes. The agency is currently developing guidelines for the commercial use of small drones. It has given out a few dozen operational certificates for non-commercial use for universities, law enforcement and for federal government research and the military. Already, some of these drones are flying over the Pacific Northwest. 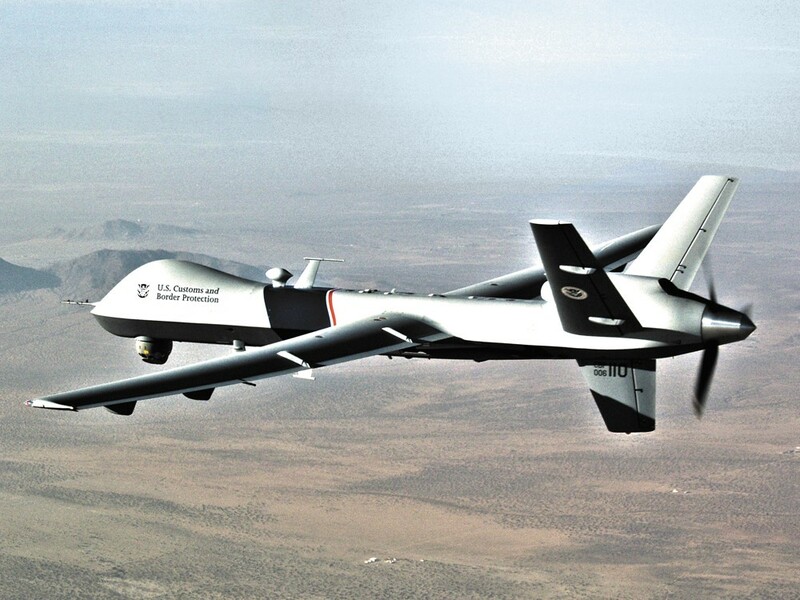 Since 2008, U.S. Customs and Border Patrol has flown a Predator-B drone along the northern border with Canada. The ungainly rear-propeller craft with a V-tail, stubby wings and a bulbous nose weighs over five tons, can reach 50,000 feet and stay aloft for 20 hours, according to the Border Patrol. One such unit flies from Grand Forks, N.D., and since 2011 has monitored the northern border as far west as Spokane airspace, the agency says. The Predator isn’t alone. There are other government drones roaming over the region. The U.S. Geological Survey partnered with the Bureau of Land Management, Washington State University and two Idaho schools last year to monitor the endangered pygmy rabbit in Idaho. And just two weeks ago, the USGS conducted a weeklong mission with a hand-launched drone known as the Raven over the Olympic Peninsula to monitor the Elwha River dam restoration project. The Raven shot video to track the movement of water and sediment where a major dam is being removed, according to Mike Hutt, the USGS’s national unmanned aircraft systems project manager. The Raven provides Hutt an impressive array of data collection and costs far less than a piloted helicopter. In addition to full-motion video, Ravens can use thermal imaging cameras, and radio antennae that can pick up signals from animal — like moose or bears — wearing radio collars. In the near future, Hutt says synthetic aperture radar — which can map terrain and geographical boundaries — will be small enough to fit on the Ravens. “The sensors are getting cheaper and more capable every day,” he says. Hutt says his office hears from large agriculture companies seeking to learn about the drones. “I personally think agriculture is going to be the largest user of unmanned technology,” Hutt says. Robert Blair would agree. It wasn’t until 2004 that Blair first got a good aerial view of the Kendrick, Idaho, farm that’s been in his family since 1903. “Flew in a Cessna over my field and saw that, wow, images are nice, you can see a lot different things that you can’t see from the ground,” he says. Through the plane’s windows, Blair saw 1,500 acres of his crops spread below — spring and winter wheat, barley, peas, lentils, garbanzo beans, some cows. He thought about how aerial technology could improve his crops, like finding patches of weeds and areas that needed more fertilizer. Until then, Blair had to do it the old-fashion way: Go out and walk the fields. So he began fiddling. What he came up with was a small craft: five feet long, with a nine-foot wingspan and mounted with off-the-shelf cameras. He uses the cameras to shoot visuals that come color-coded and tell him exactly what needs attention. Blair would like to market the field drone, which cost him $50,000 to perfect, as well as a four-rotor drone or “quadrocopter,” that he’s been developing. But due to FAA regulations that currently ban commercial use of drones, Blair can only use the machines on his own land, as a hobby. He wants to eventually start a business developing drones that can conduct the crop surveys as well as ferret out plant diseases and insects and apply herbicides — the last of which he says is being done in Japan. It’s an aero-agrarian revolution in the waiting. There’s a broad future for drones in remote areas, according to Derek Wadsworth, the robotics group manager for the Idaho National Laboratory, which has conducted research with drones since the mid-1990s. Unmanned aircraft operating laser detection-systems could measure snow pack and predict flood seasons and patterns, Wadsworth says. Others could determine the amount of harvestable timber in a forest, or monitor electric lines or oil pipelines. Scouring war-torn countries for landmines and unexploded ordinance is a use Wadsworth says he’d like to see. Wadsworth also says that Canadian law enforcement has used drones to reconstruct the scenes of traffic accidents. Besides being less expensive, drones reduce the flaws that can plague human operators spending hours in a cramped cockpit. Small drones like Ravens are flown by people using computers. Larger drones like Predators are controlled from officers sitting halfway across the world. “[Drones] don’t get tired. Their performance doesn’t degrade,” Wadsworth says. At WSU, students are working on a project that would send an unmanned vehicle up to around 60,000 feet, says Jacob Leachman, assistant professor in the School of Mechanical and Materials Engineering. The project involves using liquid hydrogen for fuel, according to Leachman. Leachman says high-altitude drones could potentially be used to map the area of large wildfires, search for lost planes or serve as cell-phone-relay stations in unstable parts of the world. WSU is also partnering with the University of Washington, Pacific Northwest National Lab and others to convert a former space-shuttle emergency landing strip in Moses Lake into a research site for drones, says Ralph Cavalieri, the school’s new associate vice president for alternative energy. The group intends to apply to be one of six sites chosen by the FAA for such research, Cavalieri says. “We’re exploring what type of an application to put together that would be an attractive package,” he says, adding that Moses Lake’s isolation combined with the large landing strip makes for a good research environment. But before drone use expands, the FAA needs to be forthcoming about how UAVs are already being deployed, according to Jennifer Lynch, a staff attorney with the Electronic Frontier Foundation, a nonprofit technology watchdog group. The EFF is trying to force the issue. The organization is suing to find out more information about how drones are being used and for what purposes. They’ve already successfully sued once. After the EFF filed a lawsuit, the U.S. Department of Transportation in April released a list of 61 institutions that have FAA authorization to use drones. They include branches of the military, government research institutions like the Idaho National Lab, universities and branches of state and local law enforcement. Lynch says drones are a threat to personal privacy because they bring a whole bunch of capabilities into one mobile platform. “A lot of cities are using cameras on street corners, private security cameras [and] police can record communications in a van,” she says. “The drone has this technology in one place. “It has the ability to be in places that a manned aircraft couldn’t be, or at a low altitude or more surreptitious,” she adds. And Lynch points to the Federal Bureau of Investigation’s history of illegally spying on people it perceived to be a threat as proof that such technology needs to be regulated. One of the police departments the EFF lawsuit revealed to be seeking a drone is the Seattle Police Department. The department announced in April its intention to use a drone to photograph crime scenes and aid officers searching for missing children or attempting to defuse standoffs. The program is funded by the Urban Areas Security Initiative, a grant program of the U.S. Department of Homeland Security. Doug Honig, communications director with the American Civil Liberties Union of Washington, says that his group is working with Seattle Police Department to develop policies. What kind of constitutional rights to personal privacy do Americans even have? “The short answer is not too many,” says Brooks Holland, an assistant professor at Gonzaga University School of Law. There is no explicit right to privacy in the U.S. Constitution, according to Holland. It’s the Fourth Amendment — which protects against unreasonable search and seizure by the government — that has become the standard bearer for privacy. But case law regarding electronic surveillance technology is far from settled. The U.S. Supreme Court ruled this year on U.S. v. Jones in favor of a Washington, D.C., nightclub owner who had been suspected of trafficking drugs. During their 2005 investigation, police affixed a GPS tracking device to a car the man used. For 28 days, the tracking device pinpointed the vehicle to within 100 feet of its location. The court’s opinion didn’t rule that the tracking device was improper, but said that police improperly executed their search warrant and thus violated the man’s Fourth Amendment rights. The question of whether long-term electronic surveillance is constitutional is still undetermined by the court. Holland says that Washington state’s constitution sets a higher bar for privacy than the U.S. Constitution. (Idaho’s constitution contains a privacy provision that is essentially the same as the U.S. Constitution’s Fourth Amendment.) And while the Washington Supreme Court has ruled that warrants are needed for police to use GPS tracking devices, the court hasn’t wrestled with technology like drones. There’s another check against authority outside of the courts or the lawmakers: public opinion. If the public can observe the government using technology unethically or illegally, people can protest. But since drones can be both small and surreptitious, the public may not be able to get mad at what they can’t see. “You [wouldn’t] have the check of community condemnation if the police go too far,” Holland says. The accident rate for drones is seven times higher than general aviation rates, and 353 times higher than commercial aviation rates. Federal authorities are already deploying them. The FBI and Drug Enforcement Administration have used Predator drones within U.S. borders. Local agencies are now developing their own drones. A sheriff’s office in Texas now has a drone capable of carrying non-lethal stun weapons; police in Mesa, Colo., has won FAA permission to operate drones all over the county; police in Ogden, Utah, developed a 50-foot-long unmanned blimp with night-vision cameras for patrols (but later scrapped it for financial reasons); and police in Arlington, Texas, borrowed a drone to help with security during the 2011 Super Bowl. The report also cites a mind-boggling next level of research: sensory equipment that can see through walls; “smart” video technology that can recognize and track people without direction; a Korean research effort to teach robots “how to hide from and sneak up upon a subject”; and the development by the Pentagon of a micro-drone called the Nano Hummingbird. With a wingspan of 6.5 inches, it weighs less than a AA battery. Meanwhile, the use of drones continues to expand around the borders. The L.A. Times reported two weeks ago that the Department of Homeland Security is beginning to fly Predators on surveillance flights over the Caribbean and Gulf of Mexico in search of drug smugglers. For his part, Knezovich, the Spokane County sheriff, says the county wouldn’t deploy a weaponized drone. He adds that the agency wouldn’t use a drone for open-ended surveillance. Instead, Knezovich says they would be tools deployed for incidents similar to last month’s shooting of two deputies making a traffic stop on a suspected heroin dealer in North Spokane. Volunteers had the sheriff’s helicopter airborne in 17 minutes after initial reports, Knezovich says. A drone could also be less expensive to fly and require fewer human resources. Smaller units, like the USGS’s Ravens, are hand-launched and, once disassembled, can be packed up in suitcases. The county’s helicopter program costs $94,000 per year and is staffed with nine volunteer pilots and a part-time mechanic, according to Cpl. Dave Ellis. The aircraft is a Bell OH-58 given to the county in 2005 by the military. In 2011 the helicopter was the first responding unit to just over half of the 583 calls for service that it took, Ellis says. “I don’t believe the UAVs will replace a helicopter, but [I] do believe that it can supplement one,” he says. Ellis says the county doesn’t currently have any funds budgeted for UAVs, though it could tap existing grants. Spokane City Council President Ben Stuckart says the city doesn’t need drones flying overhead. “I definitely would have to see a pretty strong rationale for that,” Stuckart says, citing the civil liberties concerns. “I’d rather have officers on the streets. “We have enough problems as a nation with drones assassinating people,” he adds. Nevins, the Vassar professor, admits that drones could be useful in agriculture and other peaceful roles. But as a cautionary tale, Nevins compares the drones to the introduction of the Taser, the stun gun introduced as a law enforcement tool to save lives. Since 2001, medical examiners have listed stun guns as a contributing factor in more than 60 deaths nationwide, according to a report by Amnesty International. That group believes as many as 500 deaths since 2001 have been caused or partially caused by stun guns. “It’s actually made violence easier to deploy in some ways, because it’s presented and seen as non-lethal technology,” Nevins says, referring to stun guns. And he fears the globalization of homeland security, the blurring of borders between police and military, and the proliferation of military surveillance equipment.